William C. “Bill” Arbogast, 94, of Dover died Tuesday, August 21, 2018 in the Country Club Retirement Center. Born May 11, 1924 in Stone Creek he was a son of the late Clyde and Carrie Baker Arbogast. Bill was also preceded in death by his wife, Margaret A. Arbogast on January 12, 2014; brother, Gust Arbogast and a sister, Evelyn Baker Sauser. Bill retired from Joy Manufacturing after 44 years of service. While at Joy, he also worked part-time at Baker Highway Express. Always one to keep busy, following his retirement from Joy he worked at Chuck Nicholson for many years. Bill was a member of the First United Methodist Church in Dover, and was a proud member of the 1941 State Champion Marching Band of Stone Creek High School. 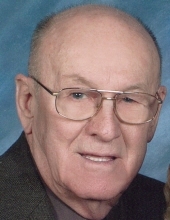 He was an active member, and past president, of the Dover Tornado Club. When his boys were young, he coached Little League baseball, and in his later years, he loved following his grandchildren in all of their sporting events. Bill also enjoyed watching the Browns, Indians, Buckeyes, Dover and Arch Bishop Hoban sports. A wonderful and loving father and grandfather, Bill will be missed by his children, David (Joan) Arbogast of Stow, Becky (Lloyd) Crilow of Sugarcreek, Greg (Jennie) Arbogast of Dover; grandchildren, Michael (Laura) Arbogast, Kevin Arbogast, Katie (Ryan) Reichert, Ryan (Kari) Crilow, Eric Crilow, Faith, Leigh and Julianna Arbogast; great grandchildren, Reese and Will Crilow; sister in law, Marilyn Arbogast of Stone Creek and brother in law, Chuck Aubihl of New Philadelphia. Cremation has been entrusted to the Toland-Herzig Funeral Home and Crematory at Dover. A service celebrating Bill’s life will be held on Sunday, August 26 at 4:00 pm at the funeral home with Rev. Gary Swogger officiating. Friends may call at the funeral home on Sunday from 2-4 pm. Following the service a luncheon will be held in the Toland-Herzig Monarch Center. Private graveside services will be held at a later date. Those wishing to express their fondest memories of Bill may do so by visiting the online obituaries link on the funeral home’s website. Memorial contributions may be made to the Community Hospice Truman House.